If you check your Google Analytics, your About Page is probably the top spot for all your visitors, after they find your site. It is a first introduction to the person behind the website, and the number one place to create a relationship, influence a sale or lead your visitors to the pages you really want them to visit. I have assessed many websites for effective content and am frequently amazed that people keep their about page so devoid of personality and uniqueness. This page is supposed to be “ABOUT YOU”, and should give your readers the taste and feel of what it will be like to work with you – especially if you are a coach! The relationship you have with your clients is key to successful coaching – so your website visitors need to get a sense of WHO you are – and your story – on your about page! Be authentic! This can be such an overused word, but it still holds true on your about page. This is the moment to bring all of your genius to the table, be honest and direct about what you do, and what you offer. Don’t hold back, be shy, or too humble when writing about yourself. Your potential clients need to know “why you”. This is the time to tell them. Who are you talking to? Not every client is a match for every business. 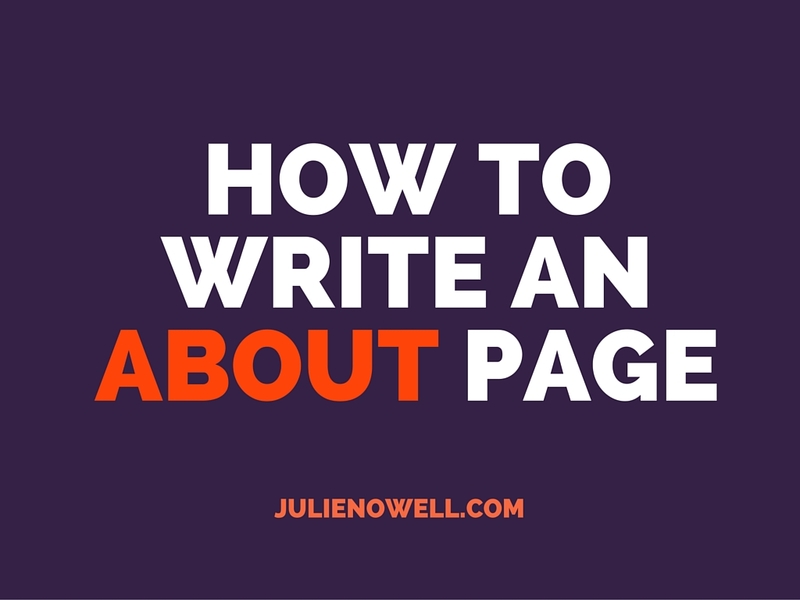 Use your about page to speak directly to the client you want to work with. You may prefer some humor in your engagement, or lean towards quick and efficient- use the words on this page to let your client know – and solidify your brand. This also helps remove any surprises when you and your client begin to work together. For example, they will know that it is good to bring humor (or it isn’t ) as will you. Say anything: My clients usually ask me at least once, “Can I say that?” Truth be told, it is your site, and your page, you can say anything. If you feel it is true and valuable to your brand definition, say it. If you are “full of awesomeness” and regularly use sentences like that in conversation, then use it. Be who you are on this page, don’t cover up your personality – it will come out eventually anyway! Be Bossy: Your about page is a “sales launch”. Give your readers someplace to go after they read about you. Tell them what to do next. It may be, “Check out my services page to decide which package is right for you” or “Sign up for my free life inspiring tips”. You want action from your readers, and the best way to get that is to ask for it directly. Be quick and easy: Don’t ramble on. Keep it short and sweet, full of personality and action requests. Don’t overwhelm them or you will lose them. Imagine a face to face meeting – would you list all of your skills and knowledge, or just give them a taste of how amazing you are? Give your reader a reason to travel on your website and explore. Feel free to send them to a detailed page listing your biography or resume, or lists of services and experience, but keep the details on your about page specific and interesting, don’t lose them at the first handshake! Why you? Tell your reader what you can do for them. Are you going to change their life? Change their business? Will it work? Why do they need you? Lay it all out and be honest, not about what you can do, but what you can do for them! In the end, this is your chance to make a great impression, so be sure to put the time and effort into it and revisit this page every quarter to ensure that you are delivering your very best message!